Belmont University Doctorate of Physical Therapy (DPT) students volunteered at the annual Sara Walker Run on September 24, held in honor of 2003 Belmont DPT alumna Sara Pigg Walker. The Sara Walker Run is a fundraising event to raise money for missions supported through the Sara Walker Foundation that are intended to help spread Sara’s message of hope to others through Jesus Christ. Sara was diagnosed with stage 4 colon cancer on her 33rd birthday in January 2011. After 16 rounds of chemotherapy and three clinical research trials, Sara’s earthly struggle with cancer ended in August of 2012, at the age of 34. During her life, Sara had two great loves: writing and bringing souls to Jesus. From her diagnosis until her final breath, she sought to use her writing to provide encouragement to those with their own challenges, always pointing her readers to Jesus. She candidly wrote of her physical, emotional and spiritual battles, praying she could provide encouragement to her more than 700,000 readers worldwide. What resonated most with her audience was the concept of “savoring”–the opportunity to enjoy the little things life has to offer and see each moment as a gift from God. Because of her great outreach to the lost and hurting, Sara’s family and close friends established the Sara Walker Foundation in 2012 to continue to provide hope to others in her honor. Because of Him, her story continues today. The first Sara Walker Run was held in April 2011, when Sara’s ‘Belmont DPT family’ sought to help raise funds for Sara’s medical expenses after her diagnosis. Due to its huge success, and in an effort to continue to honor Sara, the annual Sara Walker Run continues today and serves as the Sara Walker Foundation’s main fundraising event. This year, Belmont University and the Sara Walker Foundation provided two current DPT students with scholarships in Sara’s honor. Scholarship recipients were 3rd year students Drew Dudek and Susan Keim. Christi Williams, 2005 alumna and assistant professor in the School of Physical Therapy and Jennifer LaRocca, 2003 alumna and close friend and classmate of Sara’s, serve on the Sara Walker Foundation Board with a focus of sharing Sara’s story and keeping Sara’s spirit alive in the hearts of Belmont DPT alumni and current students. Williams shares Sara’s story with all incoming Belmont DPT students. Sara’s sister and fellow Belmont DPT alumna (2006) Dinah Hall, with the help of Williams, LaRocca and 3rd year student leaders Susan Keim and Erin St. Pierre, successfully organized the 2nd annual Kids for Kids Fun Run which included fun activities and obstacles designed by the Belmont DPT students. The kids were divided into three age groups – a “Team Green”, “Team Yellow” and “Team Red” – and given matching wristband. Each team was led by a group of three DPT students who designed a series of warm-up activities, led the kids through the course and provided cool-down activities and games afterwards. This year, the Sara Walker Run included nearly 700 participants, and the event raised $70,000 of which 100% will go toward missions supported by the Sara Walker Foundation. An exciting addition to the Sara Walker Run this year was a “Battle of the Boulevard” competition between Belmont and Lipscomb students. Sara attended Lipscomb as an undergraduate student and Belmont as a graduate student, and she loved the annual Battle of the Boulevard event between the two schools. 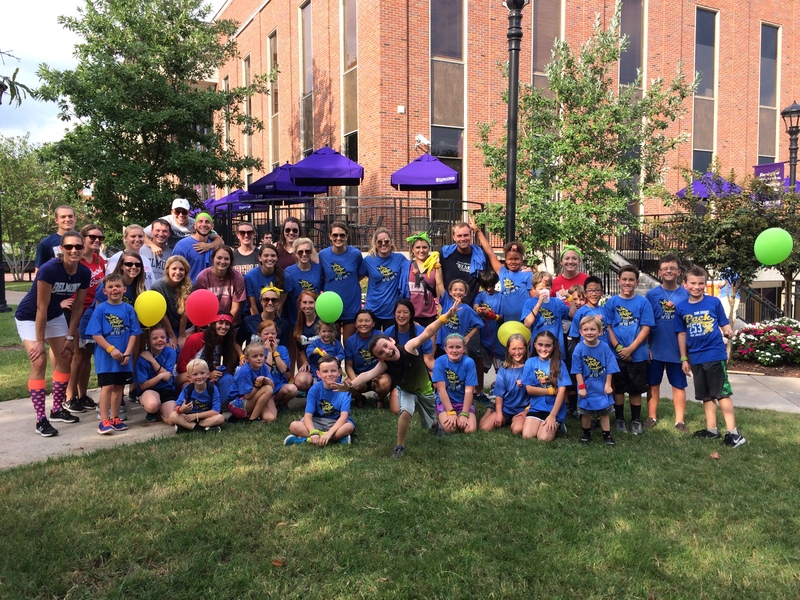 This year when students registered for the race, they indicated “Team Belmont” or “Team Lipscomb.” The trophy was awarded to Team Lipscomb this year. The competition will continue next year, and the trophy will be passed between the schools, going to whomever has the most registered runners. Also new this year, was the announcement of the new book that shares Sara’s story, “The Light Shines Through – A Story of Hope in the Midst of Suffering.” In this book, Sara’s story offers compelling lessons on how to live in the present and see God’s presence and abundant love in every moment – even those that are painful. The book will be released in January 2018. To preorder your copy and take advantage of the early release date of December 15, click here. Papa Pigg taught the kids about the importance of “doing what’s right.” This was no ordinary worship service–it was filled with excitement as Papa Pigg used short phrases and asked the children to repeat after him in loud voices. He led the children in repeating the phrase, “When God loves me, I want to do what’s right, go to heaven and help other people.” Belmont students were interspersed throughout the crowd, helping energize the children and keep them engaged in the activities. To learn more about Sara’s story and the mission of the Sara Walker Foundation, click here.